But the potatoes in this no effort dinner are really so good with the garlic and lemon. Toss in a few cherry tomatoes (or if it’s the dead of winter when this dish is a breath of fresh air) a few diced whole or even canned tomatoes along with a small handful of olives and you’ve got an insanely easy and delish meal! I love that Skillet Roasted Lemon Chicken is kind of like a little black dress of dinners. It can be dressed up or down. Toss in the chicken, potato chunks and diced tomatoes, any old jarred or canned olives and you’ve got a fantastic, homey dish for dinner. Upgrade it a bit with sliced fingerling potatoes, halved cherry tomatoes and a good Kalamata olive and if you dare, since it’s not traditional with this dish, a sprinkle of Feta – now it’s company worthy with no more effort than an everyday ol’ dinner. This Skillet Roasted Lemon Chicken is a little lighter than some, since it uses boneless, skinless chicken breast, and cooks a little faster. I love the way the chicken and potatoes pick up all the lemony, garlicky sauce that’s formed on the bottom of the pan! While I usually make the dish as stated, I sometimes toss in a few carrots, too, just for fun and besides, roasted carrots! Yum!! While this recipe is classic Greek (I first had it as a teenager; one of my Mom’s friends made it, and my Mom made it for me) you have a lot of room for improvising if you’d like. You can vary the herbs instead of using straight up oregano; maybe use a Greek seasoning of your choice or my Homemade Greek Seasoning. Nudge towards a different flavor profile if you want and go Italian with rosemary or Italian seasoning. The chicken, when perfectly cooked will be surrounded by juicy tomatoes and a lovely lemony “sauce” (the lemons on the bottom of the skillet work a kind of magic) and those potatoes are sitting in all those juices just soaking up the flavor. Just FYI, generally when the chicken is done since this is the quicker cooking boneless, skinless chicken breast version, the potatoes aren’t really browned so I cheat and remove the chicken and turn the broiler on the potatoes for a few minutes Viola! It’s the easiest way to solve that issue. I try to cut the potatoes fairly small and try not to crowd the pan too much, either, and follow the process. Sometimes I get a little overly…umm exuberant…about those potatoes and cut too many (recipes are just a guide after all) and then I toss them all in the garlicky lemon oil and any that don’t fit in the skillet got tossed in their own small skillet and roasted on the side. I give those potatoes a little extra drizzle of olive oil and put them in the oven about 20 minutes after the big skillet goes in. Turn them about halfway through with a thin spatula. Those potatoes are always crunchy, but then I suppose it defies the whole purpose of the one skillet dinner. So totally worth it, though! Don’t skimp on the salt, these simple flavors can use the boost, and watch the liquid in the bottom of the skillet; you don’t want it to dry up. If you’d like a little more of that saucy liquid, when the dish is done, add a bit more water as per instructions in the recipe. I’ve talked so much over the years about buying basics like Chicken (know your lows and stock up on sale, breaking down the family packs into sizes that suit your family) and potatoes (buy large bags, store in cool dark place away from onions) that I want to focus on the strategies for some of the other items in this dish. When shopping for lemons, keep in mind that they are usually at their low during the late winter, early spring months. Buy the heaviest lemon you can find. Roll it on the counter or microwave for a few seconds to extract more juice. Maximize the use of your lemon; if the recipe doesn’t state to use the zest or whole lemon, either zest it off and check my post on Drying & Freezing Citrus Zest. Then when lemons are sky high, you can still use some of that “bonus” flavor in a dish or frosting. As far as olives, watch for them on special around Holidays, especially around Easter, and you may be surprised to find olives, just like cans of tuna fish, on special at your pharmacies like Walgreens and CVS, on sale with a store coupon. I often find them on sale in the discount bin or shelves and olives have a shelf life way past their “best if used by date.” They’re literally fine for years. Preheat oven to 450 degrees. Arrange lemon slices in a single layer in the bottom of large 12-inch cast iron or other heavy skillet. In a medium-sized bowl, combine oil, zest & the tablespoon of juice, salt, pepper, garlic & oregano. Add the chicken, tomatoes, olives, and potatoes and toss to coat, unless using canned tomatoes; sprinkle those on top before the skillet goes in the oven. Arrange chicken in a single layer towards the center of the skillet on top of the lemon slices. If one end of the breasts is thicker, place with the thinner portion toward the center, thicker part toward the edge of the skillet. Arrange vegetable mixture over and around chicken, potatoes toward the outside. Pour any remaining olive oil/lemon juice mixture over the chicken breasts, scraping out the herbs and garlic and smearing it over the chicken. Bake at 450 for 50 to 55 minutes or until chicken is done to 165 degrees; timing may vary; check with your thermometer. If desired, remove chicken from skillet when done and place about five inches below broiler and broiler on high for three to five minutes until the tops of the potatoes are browned. Depending on how juicy the tomatoes and lemon are, this chicken will form its own sauce but check after about 25 minutes of cooking time. If it seems to be dry and is starting to stick to the pan, add about 1/4 cup of water and nudge the potatoes around just a bit. Check again at about 45 minutes of cooking time. If the skillet is dry, add a bit more water, stir the vegetables, baste, if desired. It’s your choice toward the end if you’d like to add enough liquid in the form of water to have a gorgeous sauce in the bottom or just a little so the potatoes will be a bit crispier. Just be sure to add enough water if needed during the cooking process to prevent any burning. A teaspoon of zest and a tablespoon of juice don’t seem like much, but really are plenty for this dish – it is surprising how much flavor is picked up from the lemon in the bottom of the skillet. If desired instead of oregano try a Greek Seasoning Blend. If there are leftovers, discard any rinds from the bottom of the skillet before storing in the fridge – they begin to taste really strong and overpower the dish. This recipe for Skillet Roasted Lemon Chicken was rewritten with new photos so I’ll be sharing at Fiesta Friday #262, co-hosted this week by Jhuls @ The Not So Creative Cook and Angie of Fiesta Friday. Many items with seeds can be smashed to make removal easier. 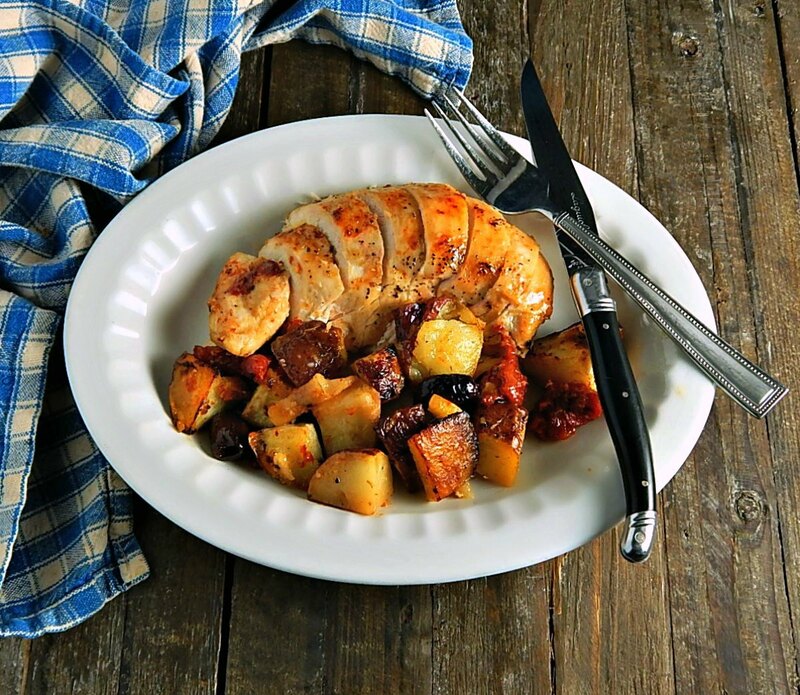 This entry was posted in Click here for Bargain Meals, Click here for Fabulous Food Posts and tagged Bargain Meal of the Week, Chicken, Chicken Breast, complete skillet meal, Greek, Lemon, Olives, Potatoes, Tomatoes. Bookmark the permalink. I love that you added kalamata olives. It’s been a long time since I had them on my meal. I prefer chicken thighs on this one. I might make this when find kalamata olives… but I can use any kinds of olives, right? Right, Mollie? Hahaha! Oh my goodness, I absolutely love your blog! Not only do you have wonderful recipes but the strategies and money saving tips are so helpful. Very clever. I spend way too much on groceries. I need to spend time reading your posts! Thank you for stopping in and leaving me a nice comment today. 🙂 I am looking forward to reading more from you.